This e-newsletter includes an important update on the state budget impasse. Please review it and share your thoughts via the survey linked below. 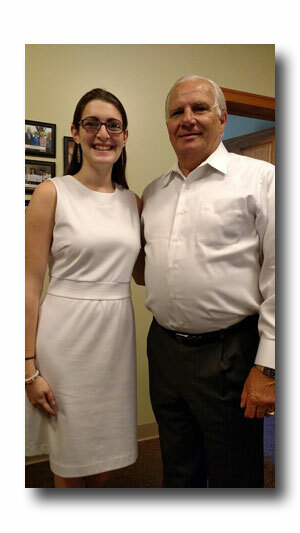 Thank You to Intern Danielle Marino! The most significant hurdle to enacting a state budget and relieving the burden on social service agencies stripped of funding is our very own governor. In March, I sat alongside my colleagues on the bipartisan Senate Appropriations Committee for three weeks of budget hearings and listened to every state department’s financial needs. In the following months, I worked hard to pass a budget that addressed the needs of my constituents and Pennsylvanians. The General Assembly passed a budget in June, without tax increases, along with an essential pension reform bill and a revised balanced school funding formula. Yet Governor Wolf vetoed it all, including the 70 percent of lines items – many for essential social services – for which there was agreement between Governor Wolf and the Pennsylvania Legislature. The governor’s budget proposal does not work. He continues to demand an increase in sales and income taxes that would result in $4.7 billion in new taxes for residents and businesses. His proposal would raise taxes by $12 billion over the next two fiscal years – an additional $1,000 for every man, woman and child in Pennsylvania. These permanent tax hikes are supposed to be in return for reductions in local property taxes. However, the administration’s own data suggest that under the governor’s proposal, residents in 401 of the 500 school districts in Pennsylvania will end up paying about 150 percent of the taxes they now pay. In addition, he refuses to acknowledge that the state pension deficit is the leading cause of increased property taxes and is depriving schools of education dollars. Seven in 10 Pennsylvania school districts reported they plan to raise local property taxes for 2015-16, with rising pension payments the single most common reason for the tax hikes. In the near future, one out of three dollars sent to school districts will be diverted from classrooms to pay the pension liability. Unfortunately, Governor Wolf has demonstrated that he believes the answer to these problems is taxing and spending more, not reform. At this point it is impossible to ignore the fact that the budget impasse is being sustained by the governor – not the General Assembly. Despite this temporary roadblock, my colleagues and I will continue to stand firm against the governor’s demands and to follow the voices of our constituents. 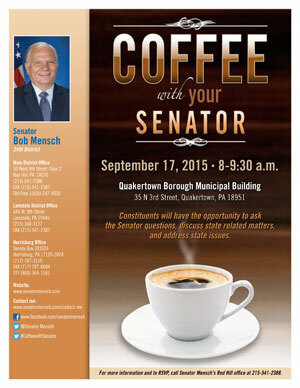 My next “Coffee with Your Senator” is days away! The event will be held on September 17th at the Quakertown Municipal Building located at 35 North 3rd Street in Quakertown from 8 a.m. to 9:30 a.m. Constituents will have the opportunity to enjoy light refreshments with me as we discuss state-related matters and questions. Senator Mensch attended the ground breaking ceremony for the new Kiddie Academy day care in Milford Township near Quakertown. 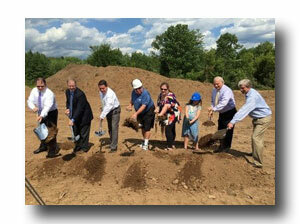 Gorski Engineering Inc. of Collegeville will be constructing the facility. 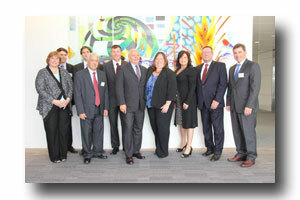 From left are Realtor Mike Golarz of Colliers International; Tom Klee, senior vice president of QNB Bank; PA State Rep. Craig Staats; Mike Zion and daughter Andrea Zion, who is owner and director of the Kiddie Academy under construction; Andrea’s daughter, Sara Claussen; Senator Mensch; and Jerry Gorski, president of Gorski Engineering, builder and developer. Constituents are invited to attend my “Protect Yourself, Protect Your Money” seminar on Friday, November 13, which will feature special guest speaker Katrina Boyer, Consumer Outreach Liaison, at the Pennsylvania Department of Banking. Ms. Boyer will discuss some of the top financial scams targeting consumers and investors, including how to identify a Ponzi scheme, home improvement scams and affinity fraud. The event will take place at 10 a.m. at St. Luke Knolls located at 1 Knoll Lane, Gilbertsville, PA. This event is free and open to the public. 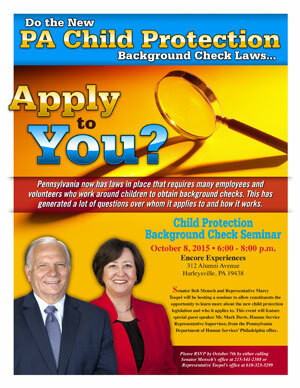 RSVP by calling 215-541-2388. Senator Mensch joined Community and Economic Development Secretary Dennis Davin for a tour at Almac Clinical Services in Souderton. Read the more about the visit here. Robert Clark, Veterans Employment Representative, from the PA CareerLink of Montgomery County will be available on September 23 and October 28 from 1 p.m. to 4 p.m. at my Red Hill office to offer employment services to veterans who have any of the six significant barriers to employment (SBE). Danielle Marino, from East Greenville, interned at my Red Hill office throughout the summer and we recognized her last day on August 12. Danielle will be entering her junior year at Arcadia College. Special thanks to Danielle for all of her hard work and we wish her best of luck on her future endeavors. Please be aware of new variations of a scam in which con artists pose as officials with the Internal Revenue Service (IRS) as they attempt to defraud taxpayers. Calls in which the caller tries to convince people they owe the IRS back taxes and pressures them to buy reloadable pre-paid debit cards to transfer the funds to pay what they owe. Robocalls with automated messages telling the consumer they owe back taxes that will result in imminent legal action and instructing the consumer to touch a number or call a number to receive directions on how to pay their taxes. Email messages containing what appear to be legitimate IRS forms, directing consumers to contact the “agency” through a link in the e-mail and provide bank account or credit card information to pay for the back taxes. These con artists may seem legitimate by referencing a consumer’s personal information that is not publicly available. Sometimes this information may have been stolen from companies which suffered data breaches. Consumers that they should remain calm and verify their tax status directly with the IRS by calling 1-800-829-1040. You should also report these IRS scam calls or emails to the Treasury Inspector General for Tax Administration at the following link. This type of criminal activity should also be reported to local law enforcement. Police then have the information to warn local residents to be on the lookout for these scams. For more information or to report any scam, contact the Bureau of Consumer Protection at 1-800-441-2555. This edition of the Mensch Report from 2013 features Last Chance Ranch and the Bucks County SPCA. While this taping may be a couple of years old, it still does a great job highlighting these two prominent shelters in Bucks County. Join me again for a tour of these two organizations. You can view it here.